"Can you get to your horse?" 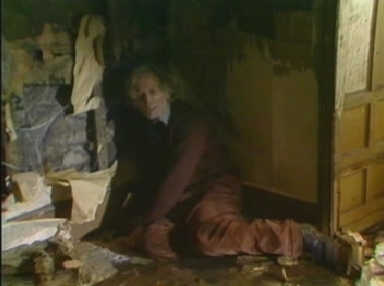 Returning to the half-way house with Sanders and Phil, Charles discovers that Fenton has escaped his ropes, and disappeared from the bedroom. 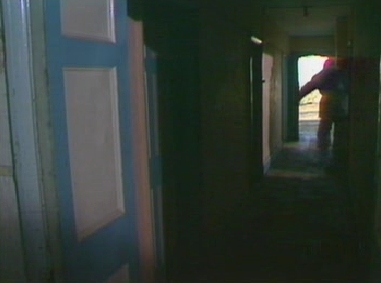 Frantically, he rushes through the house, checking each room as he goes. Eventually he locates Fenton — whose infection is now beyond question. Description: The house in question is Air Cottage — an isolated farm house (still a working farm, and now offering a bed and breakfast service) near the village of Ilam in Derbyshire. Both the 'interior' and 'exterior' locations for Fenton's half-way house were provided by Air Cottage. To view the exterior locations around Air Cottage, see here. Where is it? : Air Cottage is located high above the Dovedale gorge, close to the village of Ilam. It is accessible via a number of public footpaths (marked on Ordnance Survey maps of the area) and from a track leading off the road between Ilam and Alstonfield. The entrance to the track (which begins with a cattlegrid) is located on the right hand side near the brow of the first hill after leaving Ilam, and is signposted 'Air Cottage Bed and Breakfast'. What's the evidence? : The interior of Air Cottage was viewed and photographed by fans during the Mad Dog 2003 location trip — when access to the property was generously provided by the current residents, who were the new owners of the Cottage at the time of filming — and its use as the filming location for the interiors of 'Fenton's house' was confirmed.